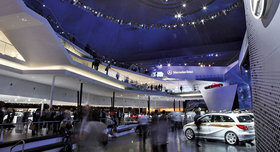 Auto executives at the Frankfurt motor show expressed concern about unresolved political and economic issues but said they are reassured by steady consumer orders. FRANKFURT -- Despite all the dire news stories here, the auto industry -- so far -- seems to be immune to Europe's financial contagion. Auto executives at the Frankfurt auto show said they are concerned as they wait for political and economic issues to be resolved. But they said they're reassured by one key indicator: Consumer orders are holding steady. "What we understand from talking to people is that there hasn't been any dramatic drop-off in orders," said GM Europe President Nick Reilly. "Even the order intake that we're seeing for this month and the month after is holding up pretty well." Reilly cautioned that GM is keeping a tight rein on production, having ordered down days at plants in Gliwice, Poland, and Zaragoza, Spain. "We are erring on the side of being short on inventory, rather than not," he said. GM is not alone. Last week Alfa Romeo told financial analysts that it plans to delay the U.S. introduction of several key models, and Ford Motor Co. is cutting production at its factory in Saarlouis, Germany, because of a drop in demand in southern Europe, where debt problems are the greatest. Reilly voiced impatience with governmental indecision about how to bail out insolvent countries: "You know it was six months ago that it was decided to rescue Greece, and we're still arguing about how to do it. It just creates confusion." Daimler AG CEO Dieter Zetsche echoed that view, saying, "We need a clear direction from the political leadership to restore confidence." But Zetsche sees no sales retreat. Daimler is sticking to its 2011 worldwide forecast and plans to sell 1.35 million vehicles -- a figure that was revised upward earlier this year, he said. "We are unchanged and very positive," Zetsche said. "That is true for all of our divisions. We just had all the markets gathered, and they all confirmed our path." Ian Robertson, BMW AG board member for sales and marketing, said BMW still expects worldwide sales of 1.6 million this year, up 10 percent from 2010. U.S. sales will improve, making the United States BMW's top market, Robertson added. Last year, Germany beat the United States by only 200 units. Audi AG has increased its worldwide sales forecast for 2011 to 1.3 million cars, up 100,000 units, because of brisk sales in the first eight months, said Peter Schwarzenbauer, board member for sales and marketing. Audi sold 1.1 million vehicles worldwide last year and originally forecast 2011 sales of 1.2 million units, he said. "The next few months are not expected to be a sure-fire success, but we are prepared," Schwarzenbauer said. "We can react to the fluctuations in the individual markets." Ford of Europe CEO Stephen Odell cautioned that automakers could be "in for a wild ride" in Europe as they watch to see the effects of austerity measures being implemented by many European governments on new-car sales. "It's so unpredictable," Odell said. "For example, will Greece stay in the euro or leave? The answer changes day by day." But despite the uncertainty, he added, Ford feels comfortable that it can withstand a downturn. 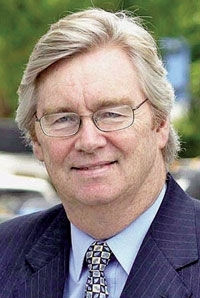 Jim O'Sullivan, CEO of Mazda North American Operations, said that economic uncertainty is "certainly plugged into everyone's psyche." But he added: "I think people in some cases are becoming immune to it. I don't mean they're discounting it, but they're carrying on with their lives." The atmosphere is stifling hiring among suppliers, some of which are struggling to keep up with automakers' production demands, O'Sullivan said. Indeed, suppliers seemed more wary than automakers. "The orders this year still seem very solid; we don't see any slowdown," said Jose Avila, head of Continental's powertrain division. "But obviously the question is: What happens next year?" Autoliv CEO Jan Carlson also said business is stable for now: "So far there have not been any phone calls" to cut production. But, Carlson said, the European debt problems and volatile stock markets could undermine consumer confidence. "When that kicks in, it all starts," Carlson said. "We are preparing ourselves for a crisis." Faurecia CEO Yann Delabriere said the "big disconnect" between orders and what is happening in the financial markets makes 2012 hard to predict. And Magneti Marelli CEO Eugenio Razelli warned: "When the carmakers decide to slow down, they do so abruptly."